When life gives you lemons, you make lemonade. When life gives you the used husks of expired lemons, it’s time to get creative. 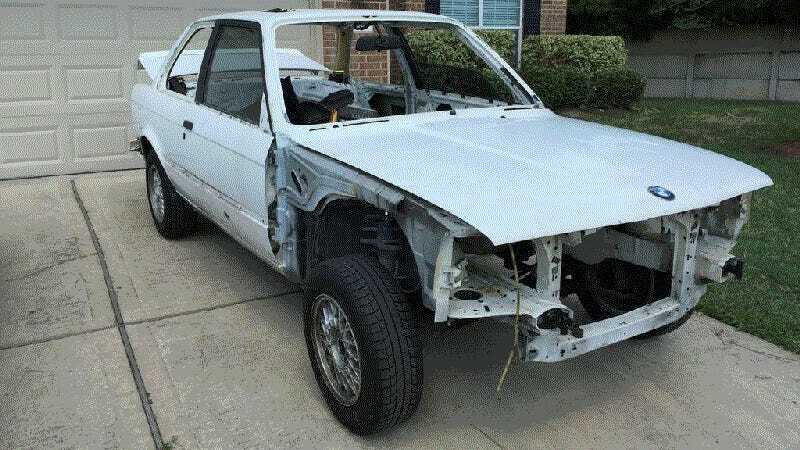 On this edition of Build Of The Week, we delve into the mind of a person that sees a $250 BMW E30 shell on Craigslist and thinks “this will be fun.” Let’s all be this guy. This week’s submission comes to us from Jordan, who thought it was a dandy idea to peruse Craigslist not for running cars, not for cars with intact drivetrains, but bare frames of old thin-metal BMWs to restore over the course of the next two dozen weekends. In other words, he’s a man after my own heart. This BMW E30 3 series started its life as a hum-drum 318i that had one of the most horrid, underpowered four cylinder engines in existence. The car’s previous owner apparently felt the same way and stripped the car down to its bare frame in order to make a fully-fledged race car. However, when he stood back and saw the millions of parts that he now couldn’t put back together again, he decided to scrap the project and sell it to the highest bidder on the world’s shadiest classified marketplace, and that’s where our story begins. After thoroughly cleaning the chassis, new body panels were installed and sent off to the paint shop, while Jordan stayed home rebuilding the car’s sub-assemblies with brand new and reconditioned OEM BMW parts. When the task of painting the car a particularly delicious shade of red was completed, Jordan got to the laborious task of putting all the new parts in their permanent homes. Speaking from experience, it’s not the hardest thing in the world to do, but there is a ton of trial and error and it is incredibly time consuming. This is as close to a figurative frame-up restoration as you can get on an amateur budget. Not to outdo himself, he decided to install an M54 3.0 liter inline six cylinder engine, coupled with a six speed transmission from an E46, using the E46 steering rack and nearly countless other upgraded components that serendipitously fit on the old bimmer with a bit of custom fab and hammer work. When everything was buttoned up, the arduous process of restoring this beater had finally come to a close. The results, in my honest opinion, stand as a testament to what you can do when you have some cash, some time, some tools, and a whole lot of determination to finish a project. It’s been five and a half months since I purchased the car. I’ve poured every free evening and weekend into the project I could find while maintaining my 50hr a week normal job. I’m still not quite done, but the car is finally in the shape I’d consider it display worthy. While the car’s a stretch from an original E30 M3, it’s arguably better in every measurable aspect because of resto-mod nature of the build. I’d urge you to scroll through the 40+ page thread from start to finish on the R3VLimited forums. It’s worth the read and it illustrates why doing things yourself is one of the most rewarding automotive experiences one can have. I’m sure that Jordan wouldn’t trade the sense of accomplishment for anything with a warranty - I sure as hell wouldn’t. If you’d like me to write a few nice or not so nice words about the money-sucking hunk of steel that is your project car, you can comment here or email me with any of your suggestions. Be descriptive and send lots of pictures. Make sure to write “Build of the Week” in the subject, or else I’ll petition to have the Knight Rider remake put back on the air. Don’t tempt me.